Customers frequently offer feedback; sometimes it is solicited, and sometimes it comes back as a complaint or a question. No matter how the delivery, it comes down to what you do with the feedback that keeps customers and affords an organization the opportunity to build customer loyalty. More often customers are displeased with a company’s service than with the product. When an organization disappoints a customer, it becomes personal. For instance, my recent experience at Chase Bank in Palm Beach Gardens is an excellent example of what went wrong and what should have been done to correct the problem. Briefly, I needed to see a banking representative to move one account to another. There were six personal representatives; two were involved with customers, and the other four were doing something else, but definitely not serving customers. It was during my lunch hour; there was a general attitude of indifference. I couldn’t wait any longer, and notified a teller I wanted someone to call me to make an appointment for the next day. No one ever called; no one ever apologized, and I wound up at another branch of Chase a few days later and closed all of my accounts. Analyzing what went wrong with the bank, it seems someone lost sight of customer importance. Customers should not have to wait while representatives are doing work at their desks. In order to establish a customer service culture, the emphasis needs to be placed on the customer. All departments need to attend to a customer so their problems can be solved and someone is not getting shuffled back and forth within the company or just left sitting in a chair wondering about the cavalier attitude of the employees. By that time, customer frustration has grown; surely not a positive experience for anyone. Someone should have come over to me and explained why I was not being served. Someone should have come over to me and introduced themselves and worked on my customer needs. There should have been trained staff members available that could have addressed my growing frustration before I became a disgruntled customer. After all, statistically 90 percent of dissatisfied customers will not return, and one unhappy customer will tell nine others. Make your customer the most important part of your work. That means put the other work away when a customer is waiting. Train all personnel so they can attend to a customer. Staff members need to have resources and the training to be able to resolve customer problems. Employees need the training so they are equipped to take action when others are engaged in business. Bring customer service to a personal level by greeting people by name. Have resolutions and compromises available. It’s not always just “yes” or “no” and be flexible. Picture yourself as the customer and how you would feel if placed in a similar situation. Reward staff members for outstanding service. Ask customers what you can do to improve customer service. The ultimate reward for companies that provide excellent service is that we keep coming back. 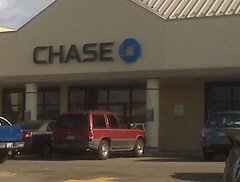 Today I was at the Wachovia Bank in Jupiter, setting up a new account. The staff provided efficient, friendly service; exactly what you expect from a well-run bank.